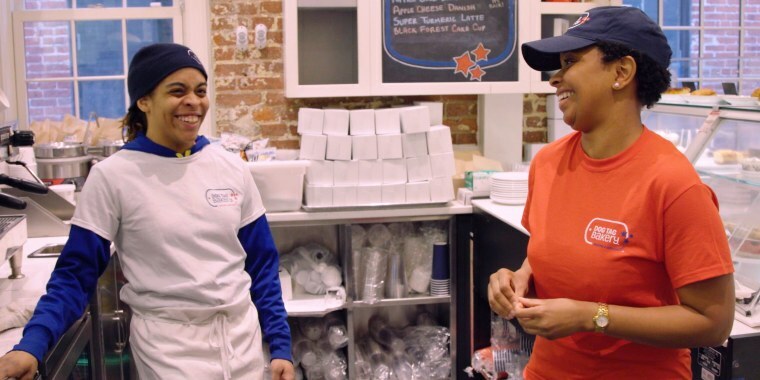 Entrepreneurship is the house brew at D.C.’s Dog Tag Bakery, where wounded vets learn to transition into the civilian workforce. From the outside, Dog Tag Bakery may seem like your typical pastry and coffee shop. But step inside and you'll quickly realize this Washington, D.C., cafe is offering more than a hot cup of joe. Dog Tag Inc. CEO Meghan Ogilvie told TODAY the program aims to "ignite the human spirit" in vets who feel disillusioned about what to do next once the service uniform comes off for good. "It's not just about a job or just about going back into education," Ogilvie said in an interview at the bakery recently. "It's really about helping our fellows to find purpose again and find a mission." Sharod Wade, a Marine veteran who graduated from the Dog Tag program in 2017, said the decision to leave the military fills many vets with uncertainty and confusion about their future. Job training resources and programs aren't always accessible, he said. "You have to kind of find yourself all over again," he said. The fellows work in both the back and front of the house while in the program. Milstein ran a bakery in Mount Kisco, New York, that employed women in need. Curry, who was born missing his right forearm, had dedicated his life to serving people with disabilities and was an avid bread maker and author of the cookbook "The Secrets of Jesuit Breadmaking." A few years before entering the Dog Tag program, Wade was homeless for a short time after he and his family were evicted from their Washington apartment. He now works in Mayor Muriel Bowser's Office of Veteran Affairs and has launched his own cleaning service company. "Once you take the uniform off, you still have a lot (of life) left," Wade said.